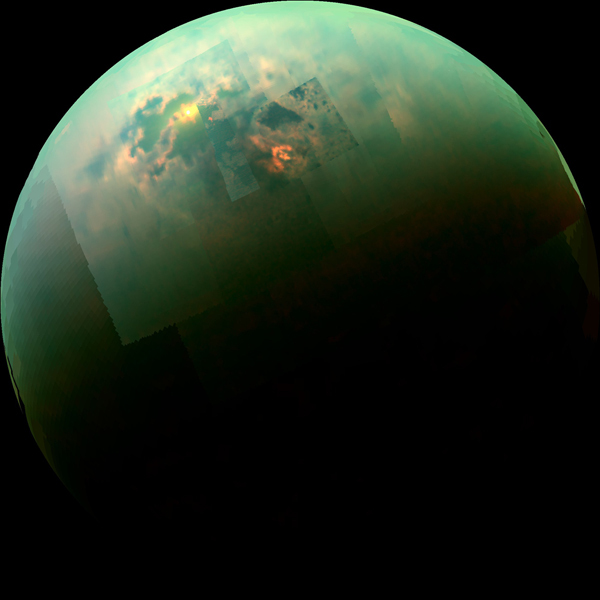 There’s nothing like the beautiful reflection of sunlight off the mirrored surface of a lovely lake… regardless if you’re on Earth or Saturn’s moon Titan! This picture, a mosaic of images acquired by Cassini’s Visual Infrared and Mapping Spectrometer (VIMS) instrument during a flyby on August 21, 2014, shows exactly that: sunglint reflecting off the super-smooth surface of the moon’s largest polar lakes. Although this isn’t the first time sunlight has been spotted by Cassini reflecting off Titan’s lakes — the last time was in July of 2009 — this is the highest-angle reflection yet, giving a much better resolution image in infrared. Because the Sun was a full 40 degrees above the horizon as seen from Kraken Mare, nearly twice as high as before, this glint was visible through the haze at much lower wavelengths… down to 1.3 microns. Read more here on the NASA/JPL news release.